The Global Institute joined several other university programs under the new School for Professional Studies (SPS), according to an email announcement by Rita Langdon, the new dean of SPS, sent on Nov. 1, 2018. Former U.S. 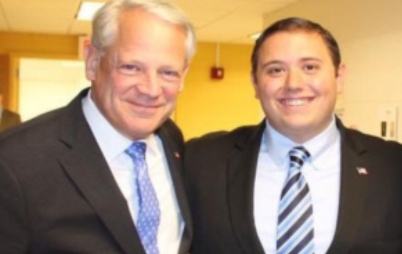 Congressman Steve Israel joined LIU in the 2017-2018 academic year to lead the Global Institute, with a mission, ac- cording to its website, of connecting our community with global leaders, traveling to foreign countries to network with leaders, and sharing education about national security and foreign policy trends. During the past two years, the Institute has hosted several events, including the Conversation with a Congressman series with guests Presidents Bill Clinton and George W. Bush. Within SPS, the Institute will be under the direction of Langdon, who has held many titles on campus including adjunct professor of public relations, executive director of campus operations, strategic partnerships and admissions, and dean of professional education and transfer and graduate enrollment. Dr. Lynne Manouvrier will also be directing the Institute. She is the associate dean of SPS who was formerly director for the center of gifted youth, and an adjunct professor in special education and literacy. Whether or not Israel will still be involved is in question. Several students who were employed in the Global Institute’s 2018 fellowship program to coordinate events are unsure of what will happen to their promised stipends after they were told these events will be discontinued. Some students working at the Global Institute said they haven’t seen or heard from any of the Institute’s staff, including Israel, since the fall 2018 semester, and they are unsure of what is coming next. 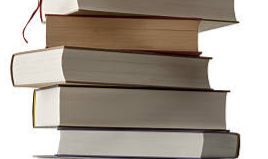 Students in the fellowship were promised $1,000 stipends for 80 hours of work. Work included staffing and coordinating events, putting up flyers, and organizing Congressman Israel’s archives to be put on display. Angelique D’Alessandro, a senior political science major, journalism minor, and executive editor of The Pioneer, was chosen for a Global Institute fellowship in the fall 2017 semester and began in spring 2018. D’Alessandro aided with several Institute events, including the talks with Vice President Joe Biden, President George W. Bush, and the anti-semitism conference. she has received about the institute was the press release about the creation of the School of Professional Studies. “I haven’t received any information from the source [the Global Institute] about what would be happening with our positions in the future,” she said. Some of the original five Institute fellowship students were paid before the Institute discontinued its events. Thomas Pallini (’18), worked as a student ambassador for the Global Institute from March 2017 through his senior year, an “unofficial” and unpaid position in which he helped promote the Institute’s on-campus events. He was later chosen for the fellowship program in 2018, and was paid a stipend after completing 80 hours of work. Pallini, like D’Alessandro, never worked directly with Israel, rather he communicated and took direction from the staff at the Institute. “I would mainly see him [Israel] at Institute events,” he said. 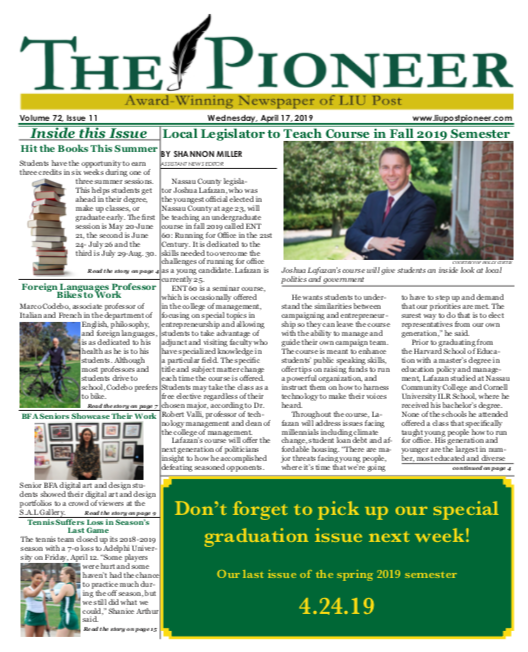 Both Israel and the university’s public relations office did not respond to the Pioneer’s requests for comment. Israel is still an active member of the university’s board of trustees, the governing body of Long Island University, according to the university website, despite having taken a salary as chairman of the Institute since 2017. “Members of the Board of Trustees serve as legal fiduciaries of the university and are responsible for overseeing the management of the institution,” the LIU website says. Israel may be starting a new program at Cornell University, according to two professors at Post and a professor at Cornell University. The details of the program are unclear. Neither Israel nor his staff responded to The Pioneer’s inquiries. Representatives of Cornell did not respond in time for publication.